Happy Father’s Day to all of you amazing Dads, Grandfathers, Uncles, Brothers…who ever you are! If you’ve ever built a project (big or small) for a loved one, I bet they see you as an amazingly talented craftsperson. Last week I asked everyone to share pictures or stories of projects they’ve built with kids, their own or simply borrowed, and in return I’d throw their names into a drawing for a set of books filled with fun projects to build with kids in the shop. You can find all the entries on our Father’s Day 2012 Kid Built Projects page by CLICKING HERE. CONGRATS to Jason Piper! 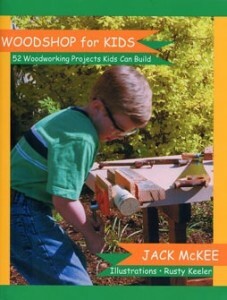 His story and pictures of him and his son building a tool box last summer just won them a copy of both “Woodshop for Kids” & “Builder Boards” written by Jack McKee of www.woodshop4kids.com.